It's the first large-scale mural for Antonio Beniquez, who has been making art since he was a little kid. HUMBOLDT PARK — Growing up, Antonio Beniquez would go to the Puerto Rican Parade every year with his family. Originally from Puerto Rico, Beniquez remembers the annual parade, held in Humboldt Park, as the biggest event of the year, wild and full of spirit. "It would probably take you an hour [to drive across the park]. There were just so many people with flags, waving. People acting crazy, of course. Standing on their roofs, standing on their cars," he said, adding "Those were the times I felt the proudest to be Puerto Rican." In recent years, though, the parade has lost its oomph, mainly because many Puerto Ricans have left the gentrifying neighborhood in search of cheaper rents, Beniquez said. As a tribute to the neighborhood's past, Beniquez painted a giant mural that simply reads, "Humboldt," at California Avenue and Division Street last week, near where the parade is traditionally held. "This is how I remember Humboldt Park. It's a tribute, even though it wasn't all positive," he acknowledged. "This is how I grew up." 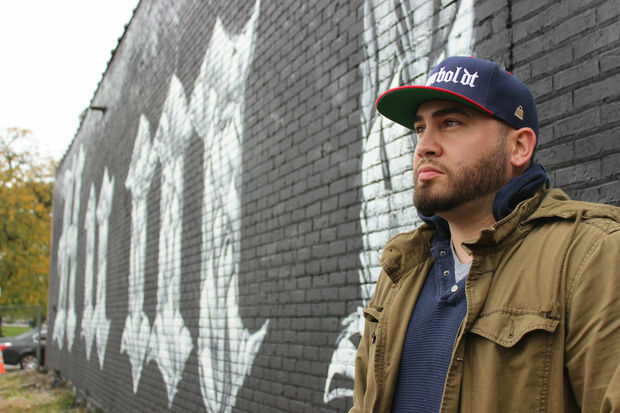 Beniquez used old English-style lettering, often found in gang graffiti, to paint "Humboldt." 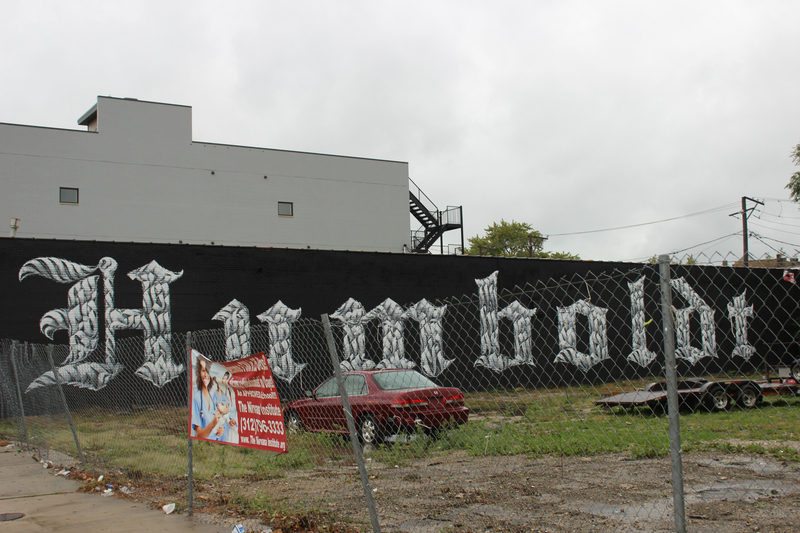 The lettering is a nod to pre-gentrification Humboldt Park, which was rife with gang violence, he said. "Whenever anyone would ask me, 'Where do you live?' I would always say, 'Humboldt.' You knew. You didn't have to finish it," Beniquez said of the 128-foot-long mural, which he painted on the side of Garcia's Auto Parts with permission from the owners. Inside the large letters are words like Chicago and Humboldt Park, which gives the mural a patterned feel. It's the first large-scale mural for Beniquez, who currently works full time as a design engineer but has been making art since he was a little kid. Beniquez has lived in the neighborhood since he was a toddler. As a teenager, Beniquez said he was surrounded by gangbangers, but he never joined a gang largely thanks to his mother, a teacher who he described as an "old-school, tough" Puerto Rican woman. He went on to study engineering at the University of Chicago at Illinois. With the mural, Beniquez hopes to give the prominent corner, one he's walked by hundreds of times, a sense of identity. "I just hope people can appreciate what it means, which is: Even if it was negative, this is how we grew up. This is the culture I remember ... And we're still around," he said. Beniquez founded a lifestyle brand, 1688Lbs, where he and his business partner, David Ortiz, sell art, clothing and accessories, including a hat emblazoned with the word "Humboldt." He's also participating in a fundraiser for hurricane-ravaged Puerto Rico on Nov. 7 at Esco Bar.